The Hungarian Vizsla, a golden-rust colored sporting dog, is one of the smallest of the pointing breeds. Nails, lips, nose and eyes blend with the coat. There is no black on a purebred Vizsla. Requires little grooming; weekly brushing, ear cleaning, nail clipping and monthly bath is usually sufficient unless they get dirty. Good with children & elderly if properly trained. Because of their exuberance though, they are quite capable of knocking down a frail elderly person or very small child. It is common for Vizslas to jump up on people and grab a hand or arm in their mouth. They are 'retrievers' and thus like things (and body parts) in their mouth. Vizslas are also notorious and determined kissers. If you cannot stand for a dog to lick your face or coat your child in kisses, this probably is not the breed for you. Very social - wants to be with people and other dogs. Strong desire to please, craves human companionship. Just being nearby won't be enough - wants to be right next to you...or on you. An "indoor dog", not a "yard dog" or a "kennel dog". Digging, chewing, and climbing fences are not uncommon behaviors in Vizslas who are left unattended in yards. Isolation and cold conditions cause illness and destructive behavior. A good watchdog; not a guard dog. Intelligent, mischievous if left alone; requires early and consistent training. Unattended, bored Vizslas (especially puppies under the age of 2) have been known to demolish furniture and other belongings. Secure accommodations are essential until the dog is old enough to be trustworthy in the house. Responds well to praise and positive reinforcement training methods. Harmed by harsh and forceful reprimands. Versatile, an excellent dog for obedience, tracking, agility, flyball, therapy work, hunting and family companion. High Energy level requires plenty of daily exercise. Short walks will not be sufficient. Energy level remains high even as they age. Vizslas were bred to hunt and have a lot of energy that must be used up daily. Requires an energetic owner who is committed seeing that the dogs get enough exercise and attention on a daily basis. Health: On the whole, this breed seems to have fewer health problems than many other breeds. Hip displaysia occurs; and allergies, often due to fleas or foods, are fairly common. 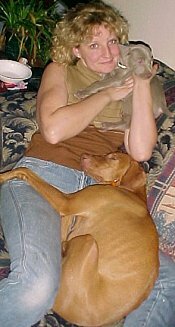 The Vizsla Club of America code of ethics states, "Breed only those dogs who are free of serious heredity defects, including epilepsy, progressive retinal atrophy (PRA), Von Willebrand disease (VWD), entropion, and cranial muscular atrophy, and who are over 2 years of age and have been x-rayed and OFA certified as free of hip displaysia."